A fine Italian violin by Giovanni Battista Guadagnini, Turin, 1778 is the featured highlight of our October 2013 New York Fine Sale. * Sold with certificates from Rembert Wurlitzer Inc., New York (October 15, 1969) and J. & A. Beare Ltd., London (December 16, 2010). 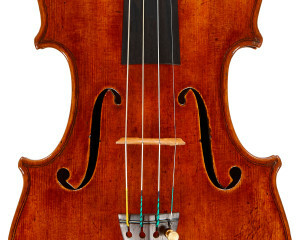 The violin that Dorothy Newhouse chose from Rembert Wurlitzer Inc. in 1969 is a strong example of the late-Turin Guadagninis that are so highly prized. It is typical of the period, with a low, flat arch emphasized by wide edges, broad corners and thick red varnish. These features were Guadagnini’s response to encouragement from his former patron, Count Cozio, to work in the style of Stradivari. Yet, typical of Guadagnini, the effort is taken to an extreme, which establishes a separate aesthetic altogether – one sought by players for its tone and by connoisseurs for its originality…*Read more about Dorothy DeLay and her Guadagnini in our Carteggio section.